Some sort of registry is a must for every engaged couple, whether you want to go the traditional route or shake it up with a honeymoon, experiential or hobby-based version. But after you add all the gifts to your wedding wish list, how are you supposed to spread the news to your nearest and dearest without seeming too, well, greedy? Like most wedding-related matters, the answer to this question comes with its own set of rules and etiquette. But with our little list of do’s and don’ts, sharing your registry will be a piece of cake. Do include information on your bridal shower invitations. Chances are, you’re not throwing your own shower, so having if the host adds a link or note to the invitation it’s totally fine. 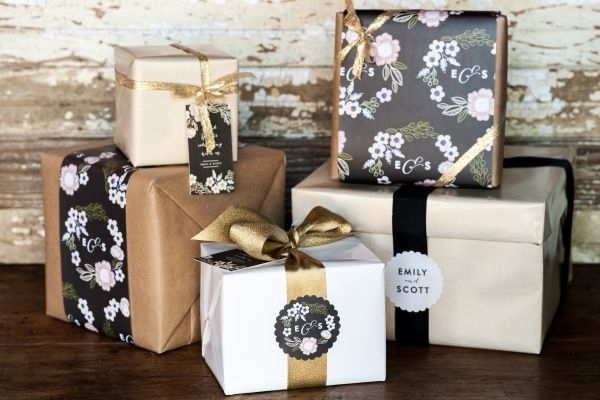 While a bride or groom asking for gifts directly can be taken as a little rude, your mom, aunt or bestie can feel free to spread the word on your behalf. And, because bridal showers are actually all about the gift giving anyway (ribbon bouquets and hats have to be made from something, after all), guests will want and need to know what it is you’d like to receive. Don’t post a Facebook status with links to your registry. While this might make it easy for some people to find your registry, don’t forget that you (probably) haven’t invited every single one of your Facebook friends to your wedding. Plus, it could cross the line into “greedy” territory. Posting a link to your wedding website — which should have easy-to-find registry links — is totally okay, though. As is texting or emailing the info to interested parties. Just make the effort to say something like “But please know that your presence at the wedding and kind words are more than enough!” to soften the request. Do include a registry page on your wedding website. Probably the best thing about the new age invention of wedding websites is the opportunity to share your registry information without seeming all “gimme gimme.” Include links to the online stores so guests can access them easily and choose their gifts without too much of a hassle. Just be careful with the language you use to introduce your loved ones to the page: Try something like “If you wish to give a gift to the bride and groom…” to make sure your guests know that gift-giving is an option. Do put your wedding website on your save the date. While you don’t necessarily have to say “Hey, we’re registered at Macy’s!” on the save the date, the announcement can be a good way to spread the word about your website. Everyone invited to the wedding (even if they can’t end up coming for the celebrations) will get that info and be able to figure out the details for themselves if they want to buy you something in honor of your nuptials. Don’t put your registry info on your wedding invitation. Make sure to add in that wedding website somewhere on the invitation, but there should be no direct mention of gifts on your invitation AT ALL — even if you’re requesting no presents. (And definitely do not ask for cash in place of gifts!) Remember, gifts are never to be required; putting information about gifts on the invite could send the wrong message to your guests and make them think that you’re expecting them to bring a present beyond their presence. Not a cool or cute vibe to give off, even as a bride-to-be. Do count on old-school word of mouth to spread the word. Back before wedding websites were a thing, guests learned about registries by asking the bride or groom’s family, VIPs, and attendants. And some traditions should never die — so be sure to share the details with your immediate family, bridesmaids, and groomsmen and let them know they can spread the word on your behalf. Ready to start building your registry?